We ship white bakery boxes at affordable prices to hundreds of bakeries across the country. We carry one of the widest selections of them online and deliver right to your doorstep very quickly. Our best brands of disposable bakery boxes are Boxit, Southern Champion and Honeymoon Paper. Lock Corner White Bakery Box - 6 in. x 6 in. x 2.5 in. Bakery Box Lock Corner White - 10 in. x 10 in. x 2.5 in. Bakery Box Lock Corner White - 10 in. x 10 in. x 4 in. Lock Corner Bakery Boxes 1/2 Sheet White - 19 in. x 14 in. x 4 in. Plain White Lock Corner Bakery Box - 12 in. x 12 in. x 6 in. 1 PC Lock Corner White Bakery Box - 10 in. X 10 in. X 4 in. White Lock Corner Bakery Box - 8 in. x 8 in. x 5 in. White Lock Corner Bakery Box - 5.5 in. x 5.5 in. 1 PC Lock Corner White Bakery Box - 8 in. X 4 in. X 4 in. 1 PC Lock Corner White Bakery Box - 12 in. X 12 in. X 6 in. 1 Piece Lock Corner White Bakery Box - 4 in. X 4 in. X 4 in. 1 Piece Lock Corner White Bakery Box - 10 in. x 10 in. x 5 in. 1 Piece Lock Corner White Bakery Box - 14 in. x 10 in. x 4 in. 1 Piece Lock Corner White Bakery Box - 10 in. x 10 in. x 2.5 in. White Lock Corner Bakery Box - 9 in. x 9 in. x 2.5 in. 1 Piece Lock Corner White Bakery Box - 8 in. x 8 in. x 2.5 in. White Lock Corner Bakery Box - 10 in. x 10 in. x 6 in. White Bakery Boxes - 10 in. x 10 in. x 4 in. Paperboard White Non Window Lock Corner Bakery Box - 6 in. x 6 in. x 4 in. Plain White Lock Corner Bakery Box - 10 in. x 10 in. x 2.5 in. Lock Corner Bakery Box Plain Board White - 12 in. x 12 in. x 6 in. 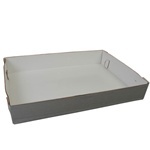 Windowed 1 Piece White Bakery Box - 10 in. x 8 in. x 4 in. White Plain Non-Window Bakery Boxes Paperboard - 14 in. x 14 in. x 6 in. White Non-Window Bakery Boxes Lock Corner - 19 in. x 14 in. x 5 in. White Non-Window Bakery Boxes Lock Corner - 8 in. x 8 in. x 4 in. Plain White Non-Window Bakery Boxes - 10 in. x 10 in. x 5.5 in. White Non-Window Bakery Boxes Lock Corner - 16 in. x 16 in. x 5 in. Lock Corner Bakery Boxes Chipboard White - 10 in. x 10 in. x 2.5 in. Lock Corner Bakery Boxes Chipboard White - 6 in. x 6 in. x 2.5 in. Lock Corner Bakery Boxes Chipboard White - 8 in. x 8 in. x 2.5 in. We have been selling bakery boxes all across the country for 40 years. We know how to take care of your restaurant supply baking goods. Make sure you put your tasty baking pies and cakes in quality white boxes.